It’s tea o’clock with Teatox and English Tea shop! If you’re on Instagram, you may have heard of this German company named Teatox. That’s how I heard of them in the first place. They are also available now on Amazingy if you’re curious to try their drinks (here). 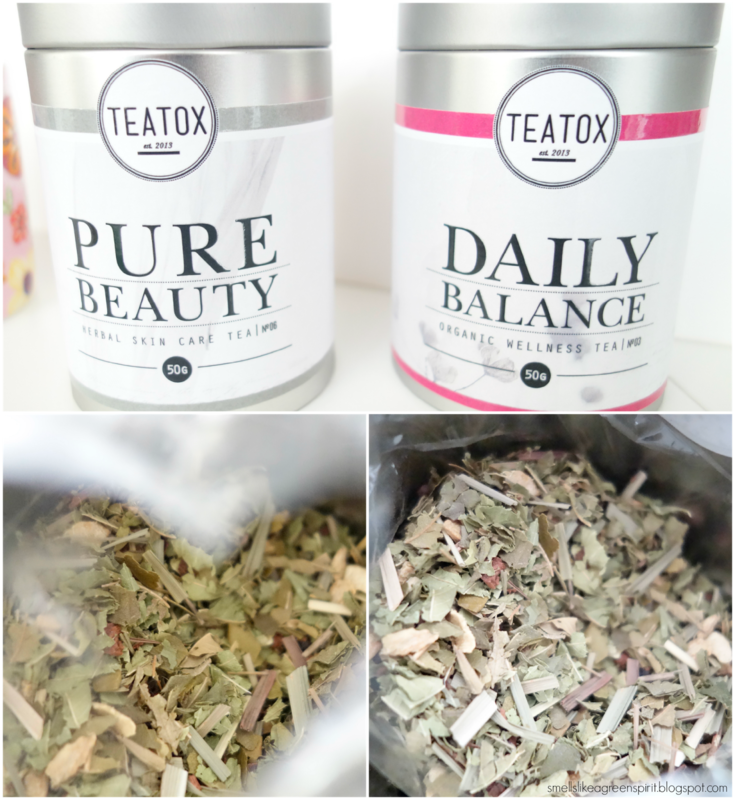 Usually, I’m a bit sceptical of these different so-called detox teas that you see all over Instagram – those specifically aimed at making you lose weight – and all the before/after pics they upload following the tea detox. Needless to say, results are mostly showing when paired with a regular physical activity and a balanced diet, not just by drinking tea (but it’s not always mentioned ha!). Instead I decided to get Pure Beauty and Daily Balance. Before I go on about the taste and the actual benefits of these two drinks, let me just point out how pretty the packaging is. I know I’ll be able to reuse those tins really quickly. That being said, I’m wondering why there aren’t any refills available. I can’t see myself collecting dozens of tins though, and in the long run it would more eco and affrodable if refills were sold. But maybe it’s going to happen in the future. An infusion of antioxidants and vitamins (white tea, pineapple, olive leaves, chamomille, lemongrass, ginger). It’s a soothing and hydrating herbal tea. In terms of results, I can’t say my skin has cleared up, however drinking tea increases my daily intake of water which is always beneficial, and I can definitely say that my skin looks much calmer. Teein-free and hydrating, this a calming blend, the taste of lemongrass stands out, which I really enjoy. Just like Pure Beauty, don’t expect something strong, you can feel a tiny ginger kick but that’s about it. On a daily basis, I feel like it helped with digestion and worked its way to relieve a bit of tension. Ingredients: Verbena, honeybush, ginger, lemon grass, lemon myrtle leaves. I found these cute individual silken pyramid tea infuser boxes in a little boutique and decided to pick up 4 flavors I hadn’t tried from one of my go-to tea brands, namely English Tea Shop. I can’t seem to find these in my local health store since they only stock the Green tea, Peppermint and Rooibos (which are tasty too). I won’t go into details about Earl Grey, because it’s not a particularly original flavor. It was a bit too strong for my taste, but it was good nevertheless. I usually don’t drink Black tea, but I was curious to try it anyway. Delightful! For those not fond of Rooibos, the taste is camouflaged by the Chocolate and Vanilla aroma. It really tastes like dessert, so obviously I loved this one. I’ll try to order it online, because one cup was all it took to get me hooked haha. Another favorite. I never realized that Pomegranate and Green tea could be such a winning combination! Pomegranate adds a slight sweetness to the bitter taste of green tea, and to me it legit tasted like candy. The taste is really fruity, and very fitting for the spring and summertime. It would also be delicious as an iced tea. A mixture of Licorice, Cinnamon, Peppermint and Lavender, which I also want to incorporate in my tea arsenal. Anything aimed at helping me feel more relaxed and zen is a winner for me. What’s your favorite drink at the moment? Beware Skin Karma: My top gentle products to heal my skin back. I'm loving white tea with lemongrass at the moment and anything with liquorice. Not gonna lie, the packaging really seduced me in the first place, but they taste as good as they look. I love tea,, like you i also got a detox tea but beging already thin and ok i didnt notice anything special..plus the smell was mmm leah (talking about your tea brand). They sound divine. I have only just started getting into tea's, I'll have to hunt theses down and give them a go. Thanks for sharing. Snack time is the best time with What’s in it?